Welcome to a world where animals rule and the only human around ... isn't human anymore. A young Inuit hunter seeks vengence against a bear, only to be magically changed into a bear himself, and his only chance to change back is with a talkative bear cub. $19.404 million on 3030 screens. Here’s the part of the review where I usually discuss how traditional cel animation is on life support while computer animation continues to prosper. However, the subject depresses me, so I’ll skip it. I do enjoy well-made CG flicks, but the continued decline of cel animation remains a sad state of affairs. At least 2003’s Brother Bear did nothing to accelerate the demise of cel animation. 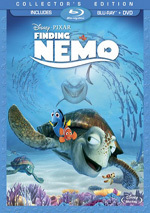 With a gross of $85 million, it didn’t exactly rake in the bucks and give Finding Nemo a run for its money, but at least it outdid cel flops like Treasure Planet and Sinbad: Legend of the Seven Seas. At the start of Bear, we meet Kenai (voiced by Joaquin Phoenix) and his brothers Denahi (Jason Raize) and Sitka (DB Sweeney). Selfish, impetuous and impulsive, Kenai nears an important ceremony to mark his ascension toward manhood. Tribe leader Tanana (Joan Copeland) will then given him a totem that symbolizes a virtue by which he needs to lead his life. When Kenai receives the bear of love, he clearly doesn’t seem too happy about this development. Bears make his life worse when his brothers discover that Kenai failed to properly secure a basket of fish, and a furry forest-dweller made off with the food. Kenai angrily chases the creature, but he ultimately puts himself and his brothers at risk. When it looks bad for Kenai and Denahi, Sitka sacrifices himself to spare their lives. This enrages Kenai, and he blames the bear. He chases after the animal and ultimately kills it. When this happens, Kenai gets swallowed by mystical light that decides to teach him a lesson and transforms him into... a bear. Naturally freaked by this occurrence, Kenai soon gets a message from Tanana who tells him what he needs to do. From there Kenai embarks on a mission to get to the top of a mountain where he can meet with the spirit of Sitka and return to his natural form. Along the way, he meets a little cub named Koda (Jeremy Suarez) who got separated from his mother. Koda wants to go to a big salmon catch where he can reunite with other bears and his mother, and Kenai agrees to go when he learns this takes place near where he needs to meet Sitka. At first, Kenai wants nothing to do with the chatty younger bear, but the two slowly start to bond and our protagonist starts to see the world from the ursine point of view. To complicate matters, a vengeful Denahi follows the pair and plans to kill Kenai. Since he doesn’t realize anything about the transformation that occurred, Denahi believes that this bear killed Kenai, so he wants to get back at the creature. The movie follows Kenai as he heads to the mountain to return to human form and attempts to keep Denahi off his trail long enough to achieve that. While not a bad flick, Brother Bear seems like one of the more ordinary Disney animated efforts of recent years. 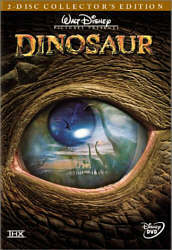 When it appeared in 2003, it offered their least interesting tale since 2000’s bland Dinosaur. Hmm... both of those movies included DB Sweeney in prominent roles. Perhaps he curses Disney animated pictures to mediocrity. At least I liked Brother Bear more than the forgettable Dinosaur. Bear enjoys a certain sweetness that occurs largely due to the charming and ingenuous performance from Suarez as Koda. The role doesn’t offer much depth or challenge, but the young actor makes the character very likable and cute. His absolute love for and faith in Kenai helps us to care for the latter. As a human, Kenai seemed like a total jerk, so we need this way to soften his personality. Suarez accomplishes that well. Also on the positive side, Bear presents some gorgeous visuals. The northern North American setting doesn’t emphasize realism at strictly. Instead, many of the backgrounds come across as somewhat impressionistic, and these elements seem quite winning. The look of the film doesn’t stray far from reality, but it varies enough to make the result fairly distinctive. Where Bear falters mainly stems from the absence of any real challenge to it. A few surprises appear, particularly related to how Kenai reacts at the end of the film, but not much else will catch the viewer off-guard. Instead, most of Bear progresses down a fairly predictable path. I don’t regard that as bad in and of itself, but the movie also fails to challenge the viewer with much real spark or distinctiveness. The movie looks a little like Lilo & Stitch at times, but it lacks that effort’s bouncy energy. Still, Brother Bear displays decent heart, and it remains consistently entertaining, if only moderately so. The movie enjoys a mix of positives but not enough to make it stand out from the crowd. Disney fans will enjoy the flick, but I doubt many will regard it as one of the studio’s better efforts. Brother Bear appears in its theatrical aspect ratio of 2.35:1 on this Blu-ray Disc - mostly. Both discs are single-sided, double-layered; the images have been enhanced for 16X9 televisions. Bear actually used two different aspect ratios on the big screen. The first 24 minutes or so featured 1.85:1 dimensions, while the rest of the movie blossomed out to 2.35:1. This became a challenge to achieve on the small screen. In the theaters, the extra width of 2.35:1 added grandness to the film, but at home, those flicks can look smaller than 1.85:1 ones. Disney handled the transition properly. The image doesn’t “shrink” from 1.85:1 to 2.35:1; instead, the former scenes come windowboxed, so when the 2.35:1 material starts, the image indeed expands the sides of the presentation. Sharpness looked very good, as the movie almost always remained crisp and detailed. During the 1.85:1 sections, a few shots looked slightly ill-defined, but those were rare and totally vanished once we went to 2.35:1. From there the movie always seemed tight and concise. Jagged edges and moiré effects created no concerns, and I also witnessed no signs of edge enhancement. The movie presented absolutely no source defects, and I thought that artifacts also caused no problems. Given its northern North American setting Bear featured a vibrant and rich palette, and the disc demonstrated excellent color reproduction. It mixed a nice variety of hues, all within the natural outdoors setting. From foliage to animals to other elements, the colors were consistently terrific. Black levels seemed similarly distinct and rich, while low-light shots came across as appropriately dense but lacked any issues related to excessive opacity. No significant concerns emerged and this turned into an excellent presentation. Although the DTS-HD MA 5.1 soundfield moderately emphasized the front domain, it presented a nicely balanced and engaging effort. Some smooth directional dialogue popped up at times, and the score demonstrated clear stereo imaging. Effects appeared in their appropriate places and moved cleanly across the spectrum. The surrounds added solid reinforcement of these elements throughout the film, and they kicked into gear well during louder sequences. The movie’s smattering of action sequences provided some nice discrete audio, with elements that seemed accurately located and dynamic. Audio quality was positive. Speech seemed natural and distinct, and the lines showed no problems related to edginess or intelligibility. The score was lush and vivid, as those portions appeared bright and dynamic throughout the film. However, the mix of pop songs came across as somewhat anemic. The tunes lacked much depth and seemed too heavy in the upper range; they definitely needed greater low-end information, though they weren’t totally free from those elements. Effects came across as accurate and clean. They demonstrated no signs of distortion, and they presented fine bass response as necessary. Except for those songs, low-end was warm and tight overall, and those elements lacked any signs of looseness. The audio of Bear didn’t dazzle, but it mostly seemed satisfying. How did the Blu-ray compare to original DVD from 2004? Audio was a bit fuller and richer, while visuals demonstrated stronger clarity and accuracy, with fewer artifacts and more dynamic colors. You’ll find the expected step up here. The Blu-ray duplicates most of the DVD’s extras. We find an unusual audio commentary from moose characters Rutt (Rick Moranis) and Tuke (Dave Thomas). Both sit together for their running, screen-specific chat. It may accompany the “family friendly” version of the film, but don’t expect this character commentary to be dumbed down for the kiddies. Indeed, I seriously doubt any youngsters in the audience will get much from it, as the patter from Thomas and Moranis seems firmly aimed at adults. That makes it a darned fun piece. I always feel leery of character commentaries, for they’re very hit or miss. They rely on the improvisational skills of the actors, which means they can be pretty entertaining or only moderately positive. Bear’s chat falls into the former camp. Comedic partners for many years, Thomas and Moranis exhibit an easy rapport that makes this track fly. Since they work in character, we get no actual information about the making of the movie. However, they interact in a lively manner and constantly riff on various elements of the movie. Moranis and Thomas toss out tons of clever and funny jokes, virtually all of which will be above the heads of kids. They discuss chipmunks as the harbingers of doom, interpret the Latin origins of “animation”, and refer to Lee Strasberg, for heaven’s sake! They even do a bit on how the sound system was invented by “Dolby” Gillis. It’s a very fun commentary that offers a consistently inventive and amusing piece. Next we find Koda’s Outtakes. This takes the Pixar route and gives us two minutes and 45 seconds of fake bloopers. These seem neither clever nor entertaining, as they feature a lot of farting and falling. After this we get a couple of musical features. We find a music video for Phil Collins’ “Look Through My Eyes”. The clip takes the standard format, as it mixes movie clips and a lip-synch performance from Collins and band. It’s a mediocre song and video. We also discover a sing-along song for “On My Way”. As with other entries in this genre, it shows the clip from the movie with Karaoke-style lyrics displayed on the screen. Yawn! With the two-minute, 56-second featurette Bear Legends two minutes and 57 seconds we get some simple stories. This area presents some Native American tales, and seems like a minor diversion. Making Noise: The Art of Foley offers a three-minute and 16-second featurette narrated by actor Jeremy Suarez. We get a light-hearted, kid-oriented look at the creation of movie sound effects; it’s basic but decent for younger fans. Art Review runs nine minutes, 57 seconds. Art director Robh Ruppel and supervising animator Byron Howard comment as we watch concept art. They offer good details about the material, and we see a lot of interesting pieces. Next comes Paths of Discovery: The Making of Brother Bear. In this 44-minute and 43-second documentary, we get the standard mix of movie clips, behind the scenes materials, and interviews. We find remarks from directors Bob Walker and Aaron Blaise, producer Chuck Williams, supervising animators Ruben Aquino, Broose Johnson, Tony Stanley, Byron Howard, Anthony Michaels, Jim Jackson, Alex Kupershmidt, art director Robh Ruppel, (now famously former) Walt Disney Company Vice Chairman and Walt Disney Feature Animation Chairman Roy E. Disney, Executive Vice President of Creative Affairs Pam Coats, composer/songwriter Phil Collins, singers Tina Turner and the Blind Boys of Alabama, President of Walt Disney Music Chris Montan, composer Mark Mancina, and actors Joaquin Phoenix, Dave Thomas, Rick Moranis, and Jeremy Suarez. The program covers a gamut of topics. We hear about the origins and development of the project, research, abandoned characters and concepts, themes and the depiction of brothers, casting, character design and development, the challenges of voice acting, visual design and backgrounds, the use of dual aspect ratios, and the songs and score. “Paths” doesn’t present a smooth and coherent documentary, as it actually consists of 12 small featurettes connected via the “Play All” option. They join together acceptably well, but they remain somewhat disjointed. That factor doesn’t create big problems, but the somewhat general nature of the information makes the piece less than stellar. “Paths” obvious covers a wide range of subjects, and it goes over all the highlights. It relates the basics of the production fairly well, and the liberal use of behind the scenes material works nicely. Collins’ comments about his work seem particularly interesting. Actually, the program discusses the music with much greater depth than any other subject, and we even find some mention of mild discord. However, most of the comments seem somewhat superficial, as we go through subjects awfully quickly, and we hear far too much praise. This gives the program more of a fluffy tone than I’d like. Ultimately, “Paths” will teach us a reasonable amount of decent information, but it doesn’t offer a terribly rich examination of the film. Next we find a collection of three deleted scenes. Including introductions from the directors and producer Chuck Williams, these last 11 minutes and 21 seconds. The first snippet shows Kenai as he attempts to atone for his lie to Koda, while the second depicts an alternate version of Kenai’s confession to Koda. Piece three includes an unused character, Muri the Squirrel. Clips one and three present storyreels, while the second features mostly rough animation. All three are entertaining and interesting to see. The following two features connect to the movie’s music. We discover a “Never-Before-Heard” Phil Collins number called Fishing Song. Collins introduces this three-minute and 45-second clip and gives us some quick notes about what would become “Welcome”. We then hear the track in storyreel form. It’s essentially another deleted scene and a good addition to the set. We also find the Transformation song with the original Phil Collins lyrics. The two-minute and 24-second piece, we see shots from the sessions with the Bulgarian Women’s Chorus and see English translations of the lyrics at the bottom of the screen. As it mixes recording images with clips from the film, it’s sort of a half-assed music video and not terribly fascinating, though it’s moderately interesting to see the translation of the words. The disc opens with ads for The Little Mermaid, Monsters University and Planes. Sneak Peeks adds promos for Epic Mickey 2: The Power of Two, Radio Disney, Mulan, Super Buddies, Return to Neverland, and Tinker Bell and the Pirate Fairy. No trailer for Bear appears here. 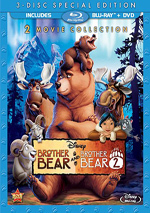 A second disc provides a DVD copy of Brother Bear. This literally duplicates Disc One of the original release – right down to the same circa 2004 ads. This means viewers can watch the movie in an alternate “family friendly” 1.66:1 aspect ratio if desired. When compared with Disney’s other animated fare, Brother Bear comes across as firmly ordinary. The movie remains consistently likable and entertaining, but it lacks that spark that would allow it to prosper and turn into something special. The Blu-ray offers excellent visuals as well as very good audio and a solid set of supplements. Bear doesn’t become a classic, but it offers a likable experience. 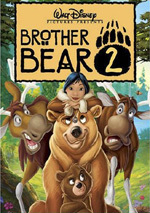 Note that the Blu-ray of Brother Bear pairs it with its 2006 direct-to-video sequel. Both appear on the same disc.